‘The Close Encounters Man’ tells the unlikely story of how the government’s astrophysicist debunker became the phenomenon’s most expert defender. In telling the life story of Hynek, the “astro-beatnik,” O’Connell winds up with a stunning panorama of the UFO movement—from fringe conspiracy theorists to amateur astronomers to agnostic scientists—as well as its colossal impact on pop culture and modern science. I recently spoke with O’Connell over the phone about Hynek’s unique story of skeptic turned believer, the scientific study of the inexplicable, and what makes a good UFO witness. VICE: What had to happen for a scientist as disciplined as Hynek to reach an epiphany and come around to a belief in flying saucers? Mark O’Connell: It was a gradual process punctuated by traumatic moments. He had been involved in the Air Force’s first UFO study, Project Sign, where he simply looked over the collected UFO reports and classified as many as he could as misidentified astrological objects like comets or meteorological phenomena like strange clouds, or normal things like aircraft or weather balloons. At the end, there were about 20 percent of the cases left unsolved. He just put those aside, thinking with enough time and resources we could probably explain those away as well. So he filed the report, went back to teach at Ohio State and Wesleyan Universities. What led to Hynek getting involved with UFOs again? Three years later, the Air Force’s UFO studies were reinvigorated under a new commander who wanted to take a fresh look at things. When he discovered Hynek was still teaching about 90 miles up the road, he paid him a visit to hear more about the work he’d done. And Hynek was shocked to discover it hadn’t faded away. People were still seeing and reporting close encounters, and there remained a consistent 20 percent that couldn’t be explained. The numbers never changed, but his thinking changed. How did Hynek’s thoughts on UFOs change? Where’s the line between a conspiracy theorist and a fact-based skeptic who becomes skeptical even of other skeptics? I don’t think we’ve found that line and that was one of the frustrations of Hynek’s career. There was a brief period in the early 1980s when his Center for UFO Studies was really thriving. They had money coming in—they had a lot of support from the scientific establishment and were able to dedicate resources to investigating UFO cases. But over time they became less exciting to other UFO people. They were grabbing fewer headlines; financing fell apart; and the center wasn’t able to do nearly as much. So I think Hynek’s efforts to bring the phenomenon into the sunlight and devote scientific study to it never had the opportunity to fully blossom. His goal was to cross that line and bring those two sides together. He came close, but I think he never quite achieved it. 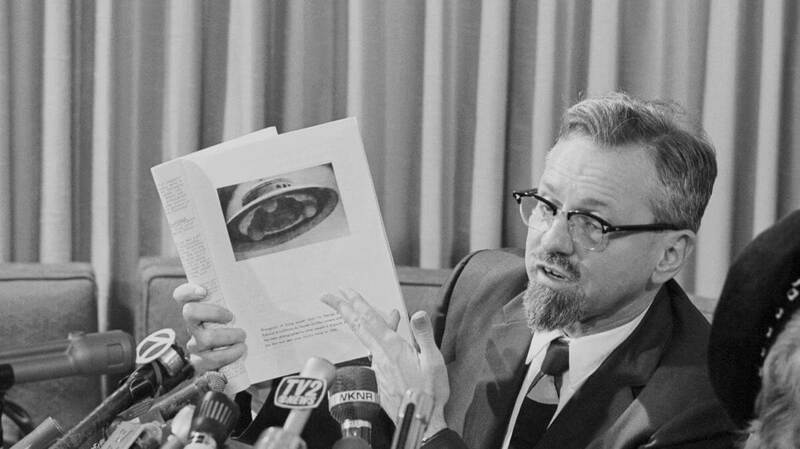 What were Hynek’s chief takeaways about the study of UFOs? Hynek observed that a meteorologist can’t study a tornado in a lab, only the results. He thought the same thing about UFOs: You have to get a little creative when you’re researching something as off the wall as UFOs, which do seem to deliberately make it hard for us to understand them. I compare it to the “Confuse-a-Cat” sketch from Monty Python. We’re the confused cat, and we need to be shocked out of our stupor by something that seems to have little to do with our version of reality. And so many of us who write and think about UFOs have to reach for new frameworks to define the issue and then study it. How has our relationship with UFOs changed in the present time as compared to Hynek’s heyday? It’s changed quite a bit. One of the sad things about my book—and maybe this makes a case for writing a sequel—is that Hynek passed away in 1986, and it was exactly a year later that the entire UFO field went through a complete paradigm shift with the publication of Whitley Strieber’s Communion [which was later made into a movie starring Christopher Walken]. Strieber was already a successful horror writer at the time, right up there with Stephen King and Peter Straub. In Communion, he tells the true—according to him!—story of his alien abduction while he and his family were staying at their cottage in upstate New York. So all of a sudden, the alien encounter narrative was flipped on its head. Up to that point, close encounters, when they were reported, generally took place in isolated locales—a lonely country highway or a deserted farm out in the boonies where there would be very few people to see what was happening. Now, afterCommunion, the aliens are appearing in your bedroom at night, a scenario Budd Hopkins and several other researchers confirmed. Now whether that shift is conscious or whether it points to some change in how we see ourselves, who knows? If on one side of the spectrum we have Carl Sagan and on the other, say, ErichVon Däniken, who theorized that ancient culture and religion was created by alien astronauts, where do we place Hynek? I would put him maybe close to the center, but more on the Sagan side. They both had a lot of contempt for UFO charlatans. So yeah, he would definitely put himself far from the Von Däniken side, but he also would have thought Sagan was being closed-minded and intellectually dishonest to a degree. What can ufology bring to modern science? The ability to use imagination as part of the scientific process. We hear all the time from NASA how, just recently, we’ve discovered a planet that has five or six other planets in its orbit or how the Tabby Star dims in such a way as to suggest an alien megastructure. We have all these wild, seemingly impossible things that are now proving to be true. At the same time, we have people—and I’m not knocking them because I love and respect the work they do—like Neil deGrasse Tyson and Bill Nye the Science Guy, who’re crusading for scientific education, but will draw the curtain on UFO stuff because it “makes us look silly.” I think we need to get past that, because it doesn’t make you look silly, it makes you look like someone who is interested in learning more about the world around us and finding the borderline of science and studying the things that science could not explain. And I think that’s a pretty good approach for any scientist. What makes for a good UFO eyewitness? A keen sense of observation is key. A strong linguistic capability is very helpful because people who see UFOs are trying to describe something unheard of in human experience and need to be able to develop a new language. Too often you see people unable to describe what they’ve seen and experienced simply because there are no words for it, at least not yet. I’ve been haunted by the fear that there is no vast conspiracy guiding the government, only stupidity and bungling. To what extent are you able to believe in the military’s ability to orchestrate certain cover-ups, as opposed to just lose things or mishandle data? Hynek made a good distinction: “You can cover up knowing something or you can cover not knowing something.” I think government obfuscation is a big part of the story, but for many people that translates into “Oh, they’re hiding something from us.” One of the first important UFO writers, Donald Keyhoe, was provoked by the fact that nobody in the Air Force would return his calls. His reaction was, “Ah ha, they’re covering something up!” Well, no, they just didn’t want to talk to you. Close Encounters Man by Mark O’Connell will be published on June 13 by Harper Collins.